We love family movie night in our home, and it's always a great one when we watch a DVD from FishFlix.com. FishFlix.com was gracious enough to allow the Review Crew to review several of their new DVDs. For this review, I received The Gospel of John DVD. 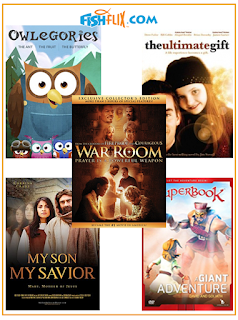 FishFlix.com is a fantastic site to go to if you are looking for Christian based DVDs that are great for the whole family. You'll find much more than just "entertainment" style movies. FishFlix.com has Bible teaching DVDs, Educational and Documentary DVDs, Catholic DVDs, End Times DVDs, and many more categories. They even have Blu-Rays! If you remember, last year I also reviewed Metamorphosis and Flight for FishFlix.com. I was an instant fan after those two films. FishFlix.com brings families amazing products that are Christian based. The company started more than a decade ago when Dr. Enis Sakirgil was involved in the making of a Christian movie titled, "Apostle Paul and the Earliest Churches." Dr. Sakirgil wanted the western world to know the rich Bible history in the country of Turkey. What started out as a means to sell and distribute that movie led to what we now know as FishFlix.com. FishFlix.com is a really great site for family friendly, Christian movies. 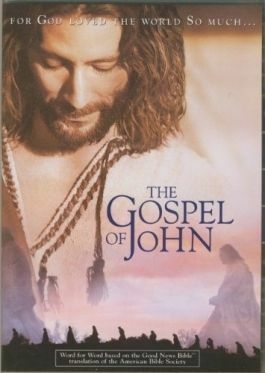 The Gospel of John is rated PG-13 and is 180 minutes in duration. It brings the Biblical book to life using the American Bible Society's Good News Bible. Directed by Phillip Saville and starring Henry Ian Cusick as Jesus, The Gospel of John is a word for word dramatization of the Book of John. This DVD contains bonus material that includes an interactive map of the Holy Land, background history, and a glossary of historical terms. We really enjoyed these extra features, especially the interactive map that kept Mr. B entertained for quite a while. The Easter season is a GREAT time to view this movie, but anytime is a great time! I tend to avoid movies that claim they are based on the Bible because I find they what they call "based on" really means they use a few names, and maybe mention a couple of Biblical occurrences and that's it. I am not a fun person to go with to see a movie based on a book due to the lack of accuracy, so I'm sure a movie based on the Bible would really get me riled up. Color me surprised when I realize The Gospel of John is a word for word account, partly narrated and partly acted out. The narration is not boring or dull in the least. It is really amazing! I could easily follow along with my Bible and see that the movie did not deviate from the words I was reading myself. This movie really puts the Gospel into perspective, and I would love to see more films like this. M has been opening his heart more and more to the Lord and wanting to go to church more. This film really helped with that, and for that I am deeply grateful. This movie is rated PG:13, but it is very family appropriate. Obviously there is no foul language or anything of that sort. There is a bit of violence in the Crucifixion of Christ, so sensitive viewers may need some warning on that. The movie is really long. 180 minutes is a LONG duration, but it is easy to pause and take a quick break when needed, and come right back. We found it to be so captivating that the need for a break was only necessary for bathroom needs, a drink/snack, or when the phone rang. FishFlix.com has been gracious enough to host a giveaway of 5 of their new releases. Please sign up for the FishFlix.com Newsletter to enter to win! The Crew was sent several movies to review, and The Gospel of John DVD is only one of those. Please click the banner below to see what else The Crew reviewed!